The CSIRO has regions for projecting the impact of Climate Change. See https://www.climatechangeinaustralia.gov.au/en/climate-projections/futur... 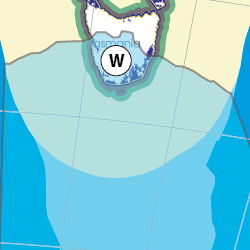 This state, SE Cape State (W), is one of the clear projections in a CSIRO cluster called "Southern Slopes region". CSIRO's Southern Slopes region coincides exactly with BloggerMe's T,O,U,V,W. "With the global population now well over seven billion there are few remaining parts of the world relatively untouched by human activity. We assess the current state and future prospects of five final frontiers: rainforests, Antarctica, the Arctic, the deep sea and space. "Antarctica is the coldest, highest, driest continent – and the one which bears the smallest footprint of human occupation. It is also the only continent designated as a “…natural reserve, devoted to peace and science”. "So how is Antarctica faring? What are the human impacts on this, the last of continents, and what might the future hold?" MR: Scrutiny of controversial support for Ta Ann http://wp.me/p29KjQ-iI via @Still_Wild @observertree1 Tassie forests still not protected!